Gov. Rick Snyder said today that he plans to sign Enbridge Line 5 legislation, but will not necessarily go along with all GOP-sponsored Lame Duck bills. Snyder and Lt. Gov. Brian Calley, who unsuccessfully ran in the GOP primary this year to succeed him, met this afternoon with about three dozen reporters, including some from national outlets, to discuss their two-term tenure before leaving office. The Snyder administration prepared a 52-page document, “8 Years of Department Success,” to accompany the governor’s final year-end press conference. Topics included Lame Duck, Enbridge Line 5, the Flint water crisis, Michigan State Police, roads and other infrastructure, Detroit’s economy post-bankruptcy and economic development and jobs. 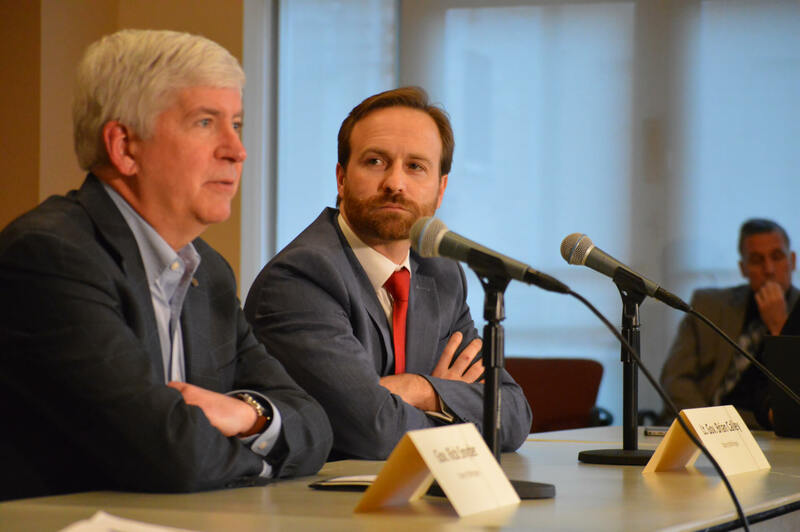 “Michigan is fundamentally a much better state than when we started,” Snyder said during his opening comments as he highlighted the “560,000 private sector jobs created” and unemployment under 4 percent. Snyder was asked whether he thought his legacy would be tarnished by the crisis. “No,” he said. “Actually, I don’t think about legacy. It not why I sought this position or the honor that I have holding this position. I’ve never viewed this about me. This is about what’s best for the people of Michigan. “I have personal feelings on it, but I will tell you that I represent the executive branch of government,” he said. “The legislative branch are my partners. I respect that they have to make their own decisions about what they going to pass and not pass. However, Snyder did commit today to signing legislation to create an authority to oversee the construction of a tunnel under the Straits of Mackinac that could encase the Enbridge Line 5 oil pipeline. This was expected, as he negotiated the deal with Enbridge and made it clear this was a top priority. The Legislature today passed a final version of Senate Bill 1197 over the objections of environmental groups. The Advance reported this week about lack of ethnic and gender diversity at the Michigan State Police. Snyder was asked today whether he thought this was a problem. The Advance asked Snyder whether MSP Director Col. Kriste Etue’s 2017 Facebook post describing black NFL players who kneel during the national anthem as “anti-American degenerates” and “millionaire ingrates” hurt efforts to recruit people of color. “I think that it took away something, but again, she apologized. She was proactive about understanding that she made a mistake,” he said. Did Snyder pass the bill for the Tunnel and keeping the current decrepit pipeline running 7 to 10 yrs until the tunnel is built? Isn’t that pipeline about 15 yrs passed it’s life expectancy? I fear for our Great Lakes. Who benefits from the pipeline? Where does the pipeline and the oil end up at?